This was my second time to ski up this way. The first time was in November when Peter, JP and I were getting our November ski in to continue our ski-every-month challenge. Back then, though we had just had a good dumping of snow, there was no base and if we didn’t have rock skies before then, we did afterwards. 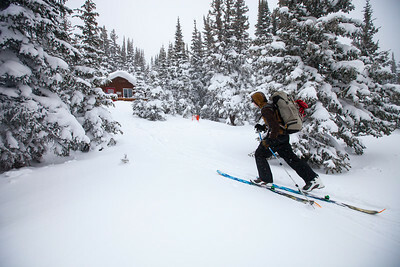 Also, we only skied part way up the Jenny Creek trail along the outer edge of the Eldora Ski Area. They don’t take too kindly to uphill ski traffic at that ski area and we were told so specifically before starting to climb. This time was different. Dave had invited a bunch of folks to ski out to Guinn Mountain Hut just below the summit of, you guessed it, Guinn Mountain. This hut is about five miles in past the ski area. The hut has been dubbed with a new name, the Arestua Hut. According to Steve who was on the trip with us and has served as the hutmeister for more years than he cared to admit to Arestua is Norwegian for “hut with a stone fireplace”. All that remains of the stone fireplace now is the foundation. Evidently it wasn’t very efficient at warming the place up. Now a small iron wood stove sits on the stone foundation. The hut is owned and run by the Colorado Mountain Club and they maintain it with a first-come, first-serve, no reservations occupancy style. It looks to sleep about eight but I’m sure it’s been filled with many more on popular weekends. I’d love to get my family out there mid week sometime and I’m sure we’d have the place to ourselves. After lunch (hot for those of us with insulated containers of hot food, not so much for those expecting a fire to get going fast enough to heat water) we continued up towards the summit of Guinn Mountain and dropped down towards Yankee Doodle lake. The snow was amazing. Though, since Steve, who probably knows the area best and became (possibly self appointed) our guide for this bit, was on NNN BC Cross Country skis, he wasn’t up for the steep and deep sections and was pretty adamant about us sticking close to him. I count it as a good familiarization trip and look forward to getting back and finding some steeper lines. From the lake we followed the Jenny Creek Trail back out and to the cars. It was about eight hours in the backcountry with only about an hour of it actually carving turns. Nevertheless, my main objective was met by getting some high res images for a story for Elevation Outdoors Magazine. Click on the image above for more photos.